The BBC reports that two customs officers, Paul Weaver and Steven Phillips (pictured) from Ramsgate have been jailed for helping to smuggle millions of pounds worth of alcohol and cigarettes into the UK. Both admitted their part in an international smuggling ring which cheated customs of more than £7m duty. Weaver was jailed for four years and Phillips for four-and-a-half years. They had pleaded guilty to conspiring to evade duties between 1 January and 10 December, 2003. 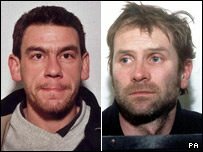 Four other members of the gang, who were convicted after a five-month trial, were also jailed. The court heard the "sophisticated" cross-Channel plot saw the contraband stashed in secret warehouses before being sold cheaply across Britain. A string of co-ordinated swoops eventually brought the year-long enterprise to a halt. Luke Whitworth of Walmesley Road, Broadstairs, provided the corrupt customs men with details of vehicles and drivers and slipped them backhanders. He was jailed for three-and-a-half years. Margate, warehouse company director Brian Murray of Botany Road was also jailed for five-and-a-half years. He escaped a six-year sentence only because he had previously been involved in charity work and was of good character.